Udaan Welfare Foundation (Udaan) is an eight year old non-profit working with the less fortunate communities in and around Thane district. Udaan empowers vulnerable groups of children, women and senior citizens through its programs focused in four areas – Education, Health, Nutrition & Wellness and Welfare & Environment. There are numerous projects implemented each year under each focus area. Some of their long term projects include running the technology center at Ma-Niketan, Day Care Center, Udaan Vigyan Ki (making science fun) and the Edufest. The Minister of Road Transport, Highway & Shipping, Mr. Nitin Gadkari, and Lok Sabha Member, Mr. A.T. Patil, acknowledged the good work done by Udaan, particularly in empowering the girl child. Udaan was the recipient of prestigious Samaj Shakti Award 2014 for its contribution in providing medical support to its community of beneficiaries. 330 girls at Ma-Niketan (Thane based Home for girls, run by Society for Helpers of Mary) receives edu-technological support at Udaan’s Ma-Niletan Technology Center. Udaan received funds from SNS REAAL Bank in Netherlands to set up the technology center. About six batches are held every day and the average daily attendance is 80-120. 60 children at Anugrah Children’s Home are served a nutritious breakfast every day since 2008. Udaan acts as a sponsor for this project. About 85 children and their families received care at Udaan’s Day Care Center. Students receive coaching after school hours on subjects they find difficult to comprehend. Training on sports is given twice a week. Playing outdoor as well as indoor games formed the part of the Day Care’s routine activities. ‘Udaan Vigyan Ki’ is a project where aspiring scientists visit two schools weekly and impart hands-on training to make toys from trash. It conveys the message that learning science is fun-filled, simple and important in our lives. 60 children benefit from this program each year. Several thousands of books on a variety of subjects are distributed each year directly to students or non-profits running schools. Tons of raw food grains are distributed each year to old age homes. The focus in 2013 was largely on supporting children, whereas in the years preceding 2013, Udaan actively implemented projects on environment conservation, clothes distribution, health check-up camps, and computer literacy programs for senior citizens etc. Lastly, the most talked about project is the Udaan Edufest. This is an annual two-day education festival in which NGOs and over 250+ children from various regions of Maharshtra, Gujarat, Daman & Diu participate. The theme for the 2014 Edufest was ‘Naari Shakti Ki’ where topics like self-defense for young women and preventing child abuse were discussed at length. 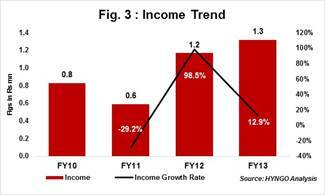 Udaan earned total income of Rs1.3mn in FY13, up 13% YoY. During FY13, Udaan received Rs0.3mn (25% of its total income) from WeKare, the CSR wing of Capgemini, a global IT and consulting company. Membership fees, which is included under General Donations accounted for 6% of total income in FY13, above the 4-year average of 5% during FY10-FY13. Udaan has a large list of 45 high profile members that are sympathetic to the work done by Udaan. Direct program cost accounted for 85% of total expenses in FY13. Of this, only 1% was spent on traveling and the balance 84% on conducting activities for direct beneficiaries. Although, this is slightly lower than Udaan’s 4-year beneficiary spend average of 88%, it is in line with the sector average of 85% in FY13. Spend on overheads in FY13 was also in line with the sector average of 9%. 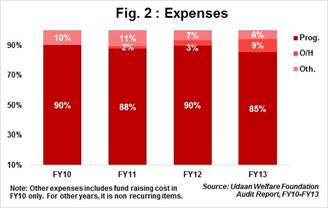 Udaan’s overheads to total expenses has been the highest in FY13 relative to the past 3-years. This is because of the variety of activities introduced and implemented in the year under review. Udaan follows a low-cost, yet effective operating model. It has no office, no staff and no fixed assets. Its entire operations are coordinated virtually, with its members and volunteers. Udaan is among the most efficiently run non-profits and can serve a role model to cash-strapped and resource-constrained Non-Profits. As a part of Udaan’s operating model, no investments were made in the past four years towards building fixed assets, therefore money collected was invested in Fixed Deposits (FDs). FDs accounted for 86% of total assets in FY13, marginally lower than 90% in FY12. It is interesting to know that despite the scale of operations, Udaan has managed to raise funds towards the Trust Corpus since FY11. The YoY growth in trust corpus was over 110% YoY both in FY12 and FY13. 4-year income CAGR for Udaan stood at 17% during FY10-FY13. There have been huge variations in Udaan’s income growth since FY10. This is because Udaan is largely dependent on contributions from individual donors. Self Sufficiency Ratio, which measures the ability of an organisation to meet its operating expenses from its own income, stood at 77% at the end of FY13 v/s 224% in FY12. The deterioration in SSR can be attributed to 23% YoY decline in FY13 income raised from individual sources (own income). During FY14, Udaan received in-kind and monetary support from over 30 corporates and several hundreds of individual donors. Although contribution from corporates has been in smaller denominations, it is encouraging to see most of them participating in various projects throughout the year on a voluntary basis. Finding volunteers to deliver training on basic computer literacy. Despite the large force of volunteers, Udaan has no access to volunteers to conduct regular computer classes. Identify a team of skilled resources for managing social media and fund raising activities for Udaan. Seeking financial support to acquire open source software and other applications for Accounting, Photoshop, Animation, etc. The Board consists of nine trustees and none of them are related to each other. In fact, it is interesting to know that most of them are regular patients of the Founding Member, Dr. Anil Luniya. Dr. Luniya is a Physician who runs his own clinic and also visits various hospitals to render his services as a Senior Consultant. The other trustees hold senior positions in reputed companies across diverse fields like Information Technology, Marketing, Engineering and Education. All trustees meet once a month and the quorum is five trustees. Udaan has a board rotation policy and elections are held every year. Not more than three members can retire in the same year. Besides the trustees, Udaan has a long list of dedicated members who are either doctors, nutritionists, businessmen, chartered accountants, educationists, home makers, etc. Udaan is listed with GuideStar India, United Way of Mumbai and NASSCOM.